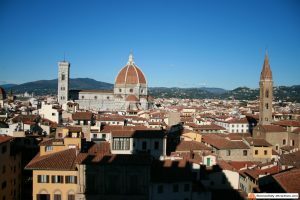 Florence has been the set of Inferno by Ron Howard just few months ago, and it’s about to become a set again for “Medici Masters of Florence”, the first TV series which will be filmed in the real locations where the rulers of the Renaissance lived. 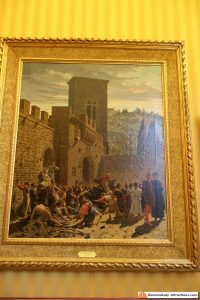 A painting by Odoardo Borrani, at the Modern art Gallery in Florence, inspired to the Pazzi Conspiracy against Lorenzo de Medici. 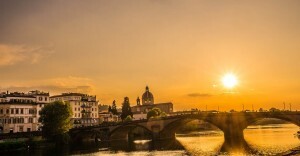 Starting in September 2015, and until December 2015, Florence and Tuscany will be the set of the new TV series, produced by the Italian Television RAI and Lux Vide. Responsible for the series is Frank Spotnitz, the American director famous for X-Files. As he said, “it will be the first time that a fiction like this will be filmed in the real palaces, streets and places where the Medici family actually lived”. The screenwriter will be Nick Meyer, who said: “I accepted this job when I understood that there is a large public in the USA waiting for a series like this. The history of the Medici family is important for the entire world because it is about the origins of the modern age, about how the Medici, starting from a concept of art considered vulgar and pagan, generated a new concept of beauty which is still set in stone; and how they invented banks creating the middle class and social mobility, reolutioning the Medieval society. Until then, if you were born poor you would stay poor, and if you were born rich you could have whatever you liked. With the Medici this changed, it is a “protestant” perspective on the Florentine history and the Americans are very interested in this”. Medici Masters of Florence will start with the death of Giovanni di Bicci and the protagonist of Season 1 will be Cosimo de Medici “The Elder”, with the birth of the Medici dynasty. The second season will be about Lorenzo de Medici “The Magnificent”. Each season should have eight episodes, and the release date should be during 2016. Even before filming, the series has been sold to several TVs, especially in the USA. Will it be a success? I can’t see any reason why it won’t. I have always wondered why nobody thought to produce a TV series on the Medici, especially after the success of the same fictions on the Borgias and Game of Thrones. The history of the Borgia family is certainly intriguing, but it’s a matter of two generations who were important for just some decades. Nothing, if compared to the Medici who have been a dynasty for three centuries (see the Medici family tree), with so much to tell about the conspiracies and intrigues, without considering that the family also had two Popes and two Queens of France. All in all, I think that not only it will be a successful production, but also that more seasons are probably coming, given that there is much more material in the history of the Medici, than just Cosimo and Lorenzo. Between September and December 2015, Florence Italy will be the set for filming a TV series on the Medici family. The series will be "Medici - Masters of Florence" produced by Frank Spotnitz, famous for X-files.